Deep inside the Fiery Pits are some of the most sought after gems in the world. Precious stones abundantly line the glistening natural rock formations inside of this volcanic death-trap. However, an aggressive cult of Burnadazi also call the Fiery Pits their home. They are attempting to raise their god, The Embreson, from his flaming tomb. Can you find the treasure and stop the Burnadazi before evil erupts? 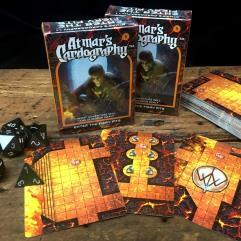 This is a 52 card dungeon crawl module for use with your favorite roleplaying game. We have created original content for Fate and Dungeons & Dragons 5th Edition. The dungeon tile cards can be used in a specific order for the module, in a random dungeon build, or as a story builder for your own setting.